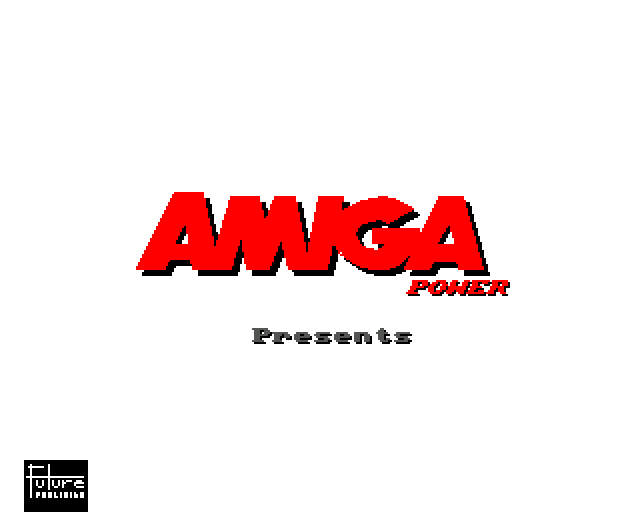 Originally released exclusively for Amiga Power Magazine on the September 1993 coverdisk 29 without any music, it was later re-released into the Amiga Public Domain by John W with music included. 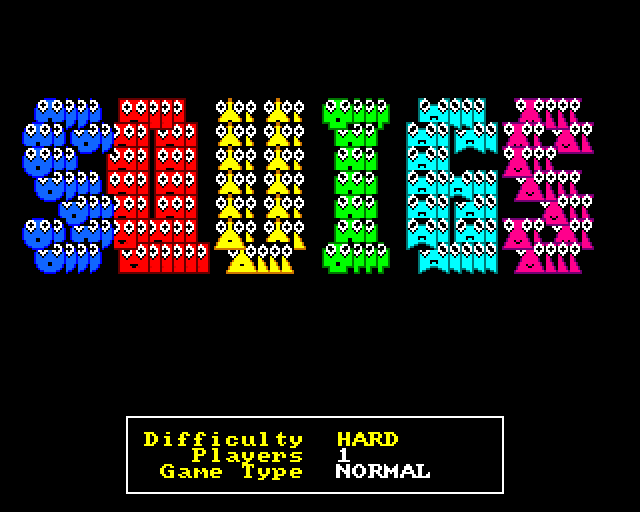 Squigs is basically a clone of Sega Columns. 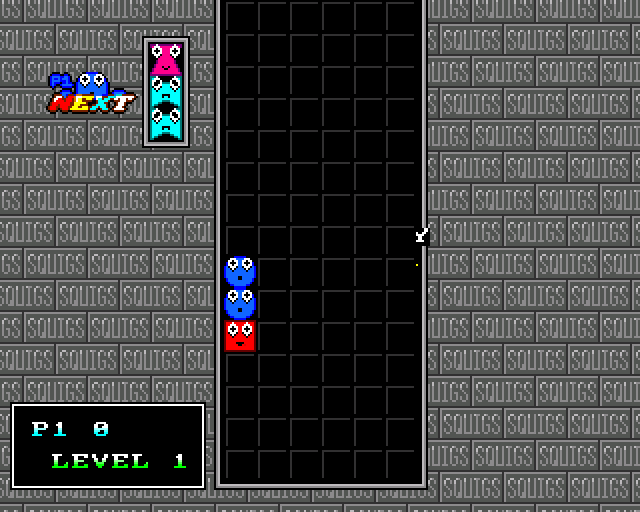 The gameplay is identical but with creatures known as squigs (basically shapes with eyes) taking the place of the jewels. For those unfamiliar with Columns, the game involves blocks of three squigs falling from the top of the screen until they land on either the floor or another squig. 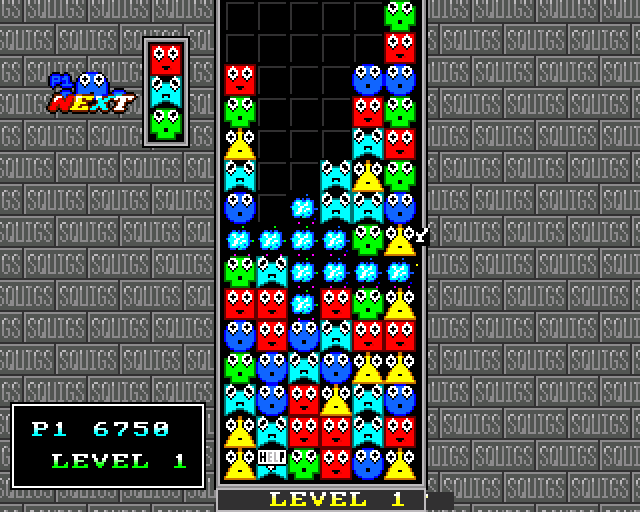 While they are falling you can move them left or right to position them over a certain column. It's also possible to change the order of the three squigs. The idea is to get 3 or more squigs of the same colour in a row (either horizontally, vertically or diagonally). 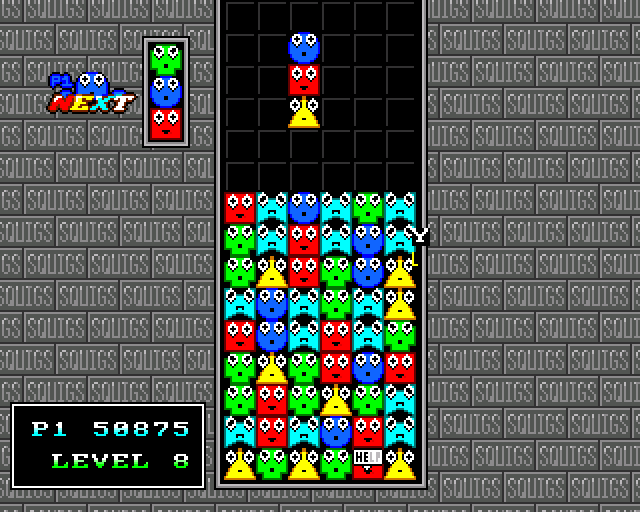 When this occurs the squigs disappear, and those above fall into the spaces (occasionally then creating another 3-in-a-row and thus a chain reaction occurs). The idea is to keep the screen clear for as long as possible which is made harder as time goes on by faster falling squigs and less space in which to put them. Once a falling squig can't fit on the screen, the game is over. 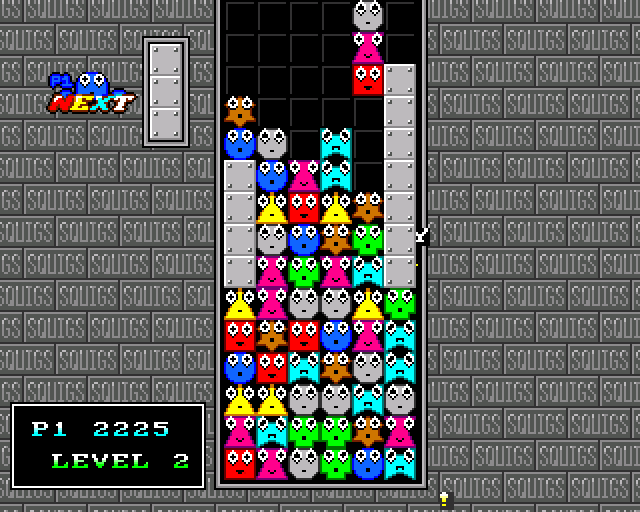 The game contains two modes, Normal which basically involves trying to clear as many squigs as possible before space runs out in order to obtain a high score and Rescue which is the same as Columns' 'Flash Game' where the idea is to make a highlighted squig (on the bottom row usually covered by other squigs) disappear. The two-player game involves you controlling alternate lines of squigs onto one playing field. 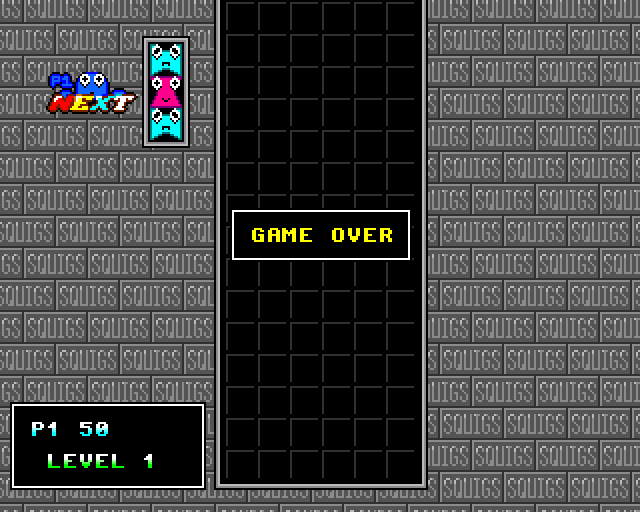 Here you must co-operate so as not to fill the screen but also compete in order to clear as many squigs and obtain the higher score. There are also a few custom blocks which sometimes take the place of the falling squig line. TNT and bombs will blow up part of the column or row surrounding it while a crystal cube will remove all of the squigs that are the same colour as the one it falls on. A steel plate also exists that cannot be removed except by one of the special blocks. Graphics wise, it's solid if not spectacular. The squigs are bright and colourful and once combined dissolve into a ball of blue sparks (or something like that). The sound effects are OK, with the squigs locking into place with a satisfying clunk, but the game is let down by a lack of music. This is presumably due to space constraints on the disk (which was shared with two other demos) but it is a shame as catchy tunes go hand-in-hand with games of this type. The game can be very addictive and fans will definitely find themselves coming back to it. Columns was a very popular game on the Mega Drive and was amongst it's top sellers, even three years after it's original release when Squigs appeared. Yet, in Squigs we had a game that played identical to it and best of all it was being given away free with a magazine. The only thing it lacked was a memorable piece of background music. 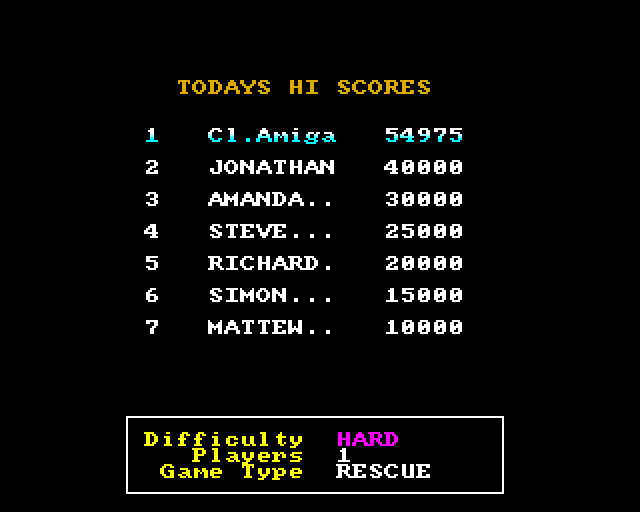 Despite this, the gameplay was executed perfectly and as such it comes highly recommended to puzzle game fans. 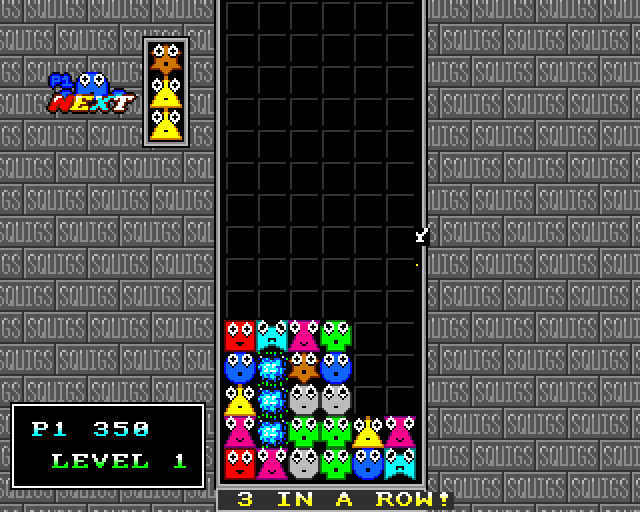 When I first saw this game it instantly reminded my of Dr. Mario on the SNES, which is another great columns style puzzle game, and shares Squigs idea of small coloured creatures instead of jewels. A Public Domain port of Dr. Mario is also available on the Amiga and also available for download on classicamiga. I always find this style of puzzle game fun and addictive and all of them play in a very similar way. 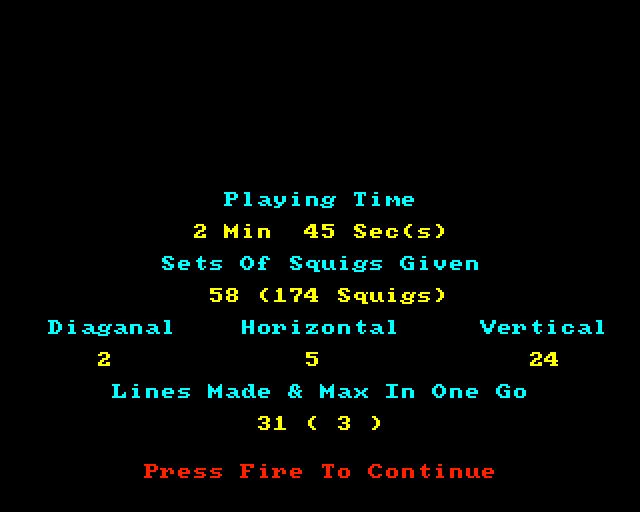 Squigs does add a rescue mode over the standard progress mode to add a bit more variety to the game.